Imagine what its like to travel all away from home for the very first time with an intent to stay there for the next few years and not knowing how to cook food! That exactly how PhD student Laxmi (Lux) felt, but than she had saviour, comrade and roommate Meghana (Meg) to her rescue. This book is designed by the authors as 'a handbook as much as a cookbook to spare students the painful trial and error part' when living on their own abroad. I could completely relate to the book as I've lived on my own during my college days and had to fend for food myself. And it will too for anyone who has studied abroad at some point in their life. Meg and Lux have wonderfully described their experiences and their culinary adventures whilst sharing their tried and tested recipes. Their memory building up to each recipe is a yummy piece of nostalgia. 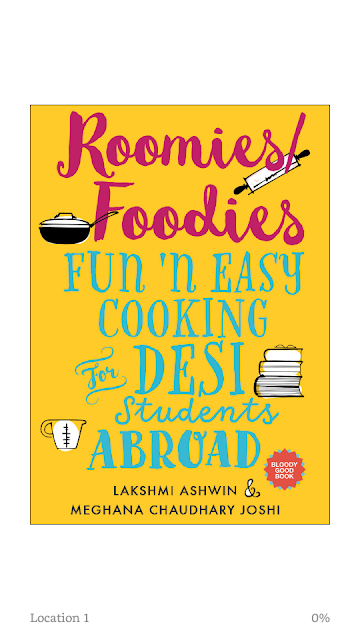 It is indeed a handbook for those who want to focus more on their studies/ work but at the same time do not want to miss out on eating Indian/ Desi food. The time saver and money saver tips are mighty useful for desi students who are taught to be skinflints from day one of their lives. I would readily recommend it to my friends who plan to study/ work and live abroad. Will be trying out 1-2 recipes from this book in the next few posts. (c) All content and photographs re copyrighted by Gauri Kamath. Simple theme. Theme images by linearcurves. Powered by Blogger.